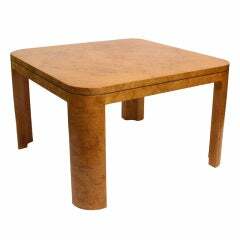 With its angular, symmetrical base and bevelled top this design is available as a console, occasional or dining table, with the option of specifying a lacquer color to the top. Shown here in black lacquered walnut. Fourth image shows the lacquer top finish on the variation Edo Ocassional . Each Stuart Scott piece is built by hand in our workshop in Wiltshire, England. Nothing is mass-produced. This ensures complete attention to detail, structural integrity and sheer build quality. We never compromise. When we finish each piece, it is signed and numbered: a unique handmade masterpiece. Customers can choose from the following timber finishes: Oak - Oiled, Aged, or Ebonised. Walnut - Oiled, Ebonised, or Black Lacquered. There is also the option to have the top lacquered in a RAL colour*. *RAL coloured top carries an up-charge of £1,200.00. 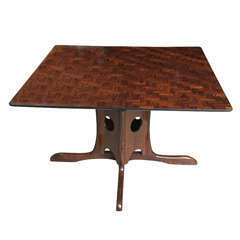 The top inlaid in herringbone pattern over a pierced sculptural base, coconut wood, mesquite and rosewood, Don Showmaker. 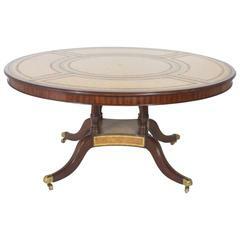 Paul Frankl, Johnson Furniture Co.
Rare "Cloud" game or dining table designed by Paul Frankl for Johnson Furniture Company, rendered in lacquered leather top and mahogany legs with brass sabot feet.